It’s not bragging to say that I have hatched tens of thousands of eggs. I started raising poultry in my teens. In my junior year of college I changed my major to poultry science, and everywhere I’ve worked since, at least some of my duties were in the hatchery. 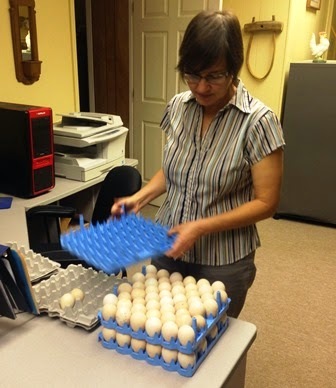 From 1996 to 2002 our small team incubated, hatched, and raised chickens. We hatched about 12,000 chicks a year, in batches from 100 – 2500. Mostly we used reliable machines made by Jamesway in the 1960s and 1970s, with a capacity of about 2500 chicken eggs. We also used GQF hatchers, and NatureForm Safari for incubation and hatch (wish I could afford one of those, they are great). In later years, even when I wasn’t hands-on for the whole process, I was setting eggs, candling, pulling hatches and working with the hatchery team to troubleshoot. 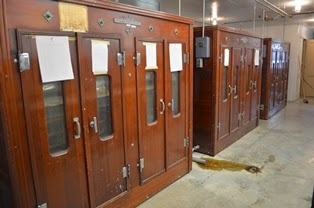 I designed and built hatcheries, got them started, assessed the ventilation in the room and in the machines. It’s safe to say I considered myself an expert. So when a donor contributed funds to The Livestock Conservancy in 2013 to buy an incubator and hatcher for our Java recovery project(Java Project), I figured I had it covered. Surprise! Maybe there’s a difference between breeds. Mostly I hatched commercial broilers and layers in my other jobs. We know that some of the Java flocks don’t hatch as well as other breeds, but I’m afraid my results with other breeds can’t be bragged about either. Maybe it’s something to do with incubating in our small (to me!) GQF Sportsman, which doesn’t have the insulation of the machines I used before. Also, I can’t dial in the humidity on the Sportsman like I did on those other machines. We’ll come back to that. Right away it was clear that I needed to use higher humidity in the hatcher than back in the “old days”. That has pretty much solved the issues with sticky chicks. But the incubation settings still aren’t quite right. I should say right off the bat that I have records. And data. We record the temperature and humidity twice a day, and I breakout and stage all the unhatched eggs. That’s how I was taught! 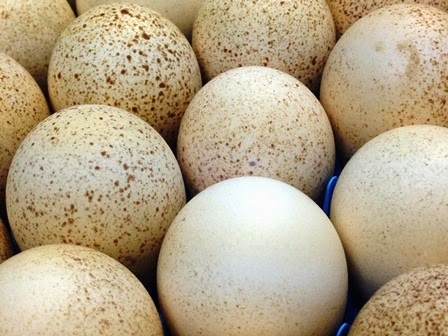 By the end of the 2013 season, things weren’t too bad, with hatch-of-fertile above 80%. There was still room for improvement in late-stage mortalities (just before transfer and in the hatcher). The humidity tends to run about 54-56% during incubation, and based on the size of the air cell I think that’s too high. Our friend Gra in SC has travelled this same path and suggested letting the water pan dry out completely every few days. That seems to help. Then we crank up the humidity in the hatcher to avoid sticky chicks. Now we have a large group of turkey eggs in the incubator. I haven’t hatched turkey eggs in years, so I asked what settings to use. Both the breeder and our friend Julie in NC said, 99.5F and 54-62% humidity. It’s easier that the humidity setting is closer to where it naturally wants to be. But after candling Wednesday there were about 22% clear. I went ahead and broke them out, and again almost all had died in the first 7 days of incubation. This is the largest group we’ve had in the incubator at once, and I’m nervous. The air cells are a little big. Yesterday the power went out for an hour and a half! I won’t give up. Undoubtedly it’s good for me to eat some humble pie, and remember what it was like to be a beginner. Some days I’m ready to pull my hair out. Then we get cute healthy chicks and I’m thrilled. I’m grateful to our friends and members who have given me advice. I’m grateful for my colleagues who haven’t sacked me (joke, ha, ha). I hover like a broody hen. This _can_ be solved! Are you working on a new or old problem, trying to master some animal husbandry skill? We are ALL always learning, and always finding situations we’ve never encountered before. With persistence, advice, patience, and humility, we’ll learn and improve. Until the next new thing comes along!